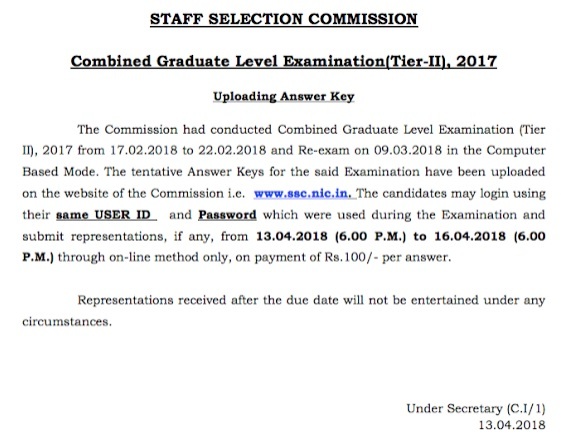 SSC (Staff Selection Commission) has released the final answer key for SSC CGL Tier-2 exam. Commission had already declared the SSC CGL 2017 Tier-2 result on 6th June & uploaded candidate’s marks on 12th June. Candidates will find the question paper as well with own answer key. Step 1 : Click on the above given direct link given to download SSC CGL Tier-2 Answer Key. Step 2 : Enter your roll number and Password. Step 3 : Select your exam date and click on ‘Submit’ button. Step 4 : SSC CGL Tier-2 Answer Keys will be displayed on your screen and can be downloaded for future reference. Step 6 : Click on Combined Graduate Level Examination 2017 (Tier-II), Uploading of Final Answer Keys alongwith Question Paper(s) reg appearing on website. Candidates can check own SSC CGL Tier-2 Exam result by clicking on below link. Candidates can know about their marks of SSC CGL Tier-2 by clicking on below link. Shortlisted candidates can download the SSC CGL Tier-2 Hall Ticket / Admit Card by clicking on below link. Candidates can prepare the exam based on the syllabus for SSC CGL Tier-3 (Descriptive Exam) by clicking on below link.